My Neighbor’s Dog From Hell…! This dog is a hell-spawned creature that barks all night every time his irresponsible and inconsiderate demon-master is out for a binge of bar hopping. This creature should be tounge-tied and thrown back to hell where it came from together with its demon-master! But I don’t blame this hellish creature, his demon-master is to be blamed. Please offer the traditional recipe for lumpia, and if anyone reading this has no clue what it is, make it and eat it. Mmmmmm…. I was planning to give it a strip of bacon or a commercial dog-bone that will keep its mouth busy and stop it from barking… hahaha! Maybe try to use the nice approach. It is extremely hard when the person in need of Cesar’s training is a d-bag, but just because you are not genuinely sincerely meaning kindness doesn’t mean it has to come across as demon neighborly hate. If the dog is not vicious can you simple ask if the dog can stay with you while the neighbor goes out with friends in the evening? Maybe leave an unsigned note that says, “Your dog is so beautiful how could anyone not want him? All we ask is that you properly take the dog for LONG walks, bike rides, or some kind of activity to reduce its energy and excessive barking while you are out because nobody wants to be a jerk and e forced to call management and cops. Nobody wants you to have to get rid of your strikingly beautiful dog, either. I’m sure you are a responsible tenant and non-abusive dog owner. Thank you for caring about your dog and your neighbors. — Sincerely, Your Neighbors. The dog looks vicious and it’s grinning. Yikes! It’s a demon from hell! How I hate this dog… Hehehe! That’s how he trained the dog, as mean as him. So, now the neighbor is keeping the dog in check, attempting some measure of being responsible & respectful then u post a pic of the dog and say how your neighbor is, basically, a jerk? I don’t understand. How is that type of negativity helping any tension? Ask yourself if that is what a kind neighbor does to another neighbor. I’m just saying’ is all. 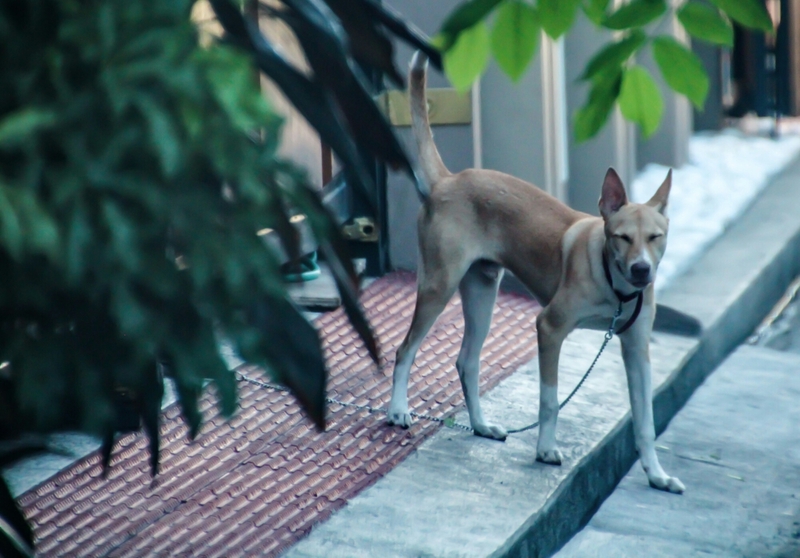 … because I saw the dog left outside and is barking on cars and people passing by. A responsible owner doesn’t tie his dog outside and leave it there, right? Anyway, thanks for dropping by and giving me a piece of your thought. Cheers! LOL! I knew you were a cool guy with a sense of humor!